Nisekoi: Tsugumi & Marika is an Event Course in Super Mario Maker, released on February 18, 2016. It is one of two Event Courses to unlock the Chitoge Kirisaki Mystery Mushroom costume upon completion. It is based on the Nisekoi manga and anime. The left path starts with a segment where enemies must be taken out with a Fire Flower. Mario will then reach a segment with Bullet Bills, and must use a beanstalk to make it past the area. 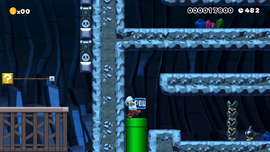 This leads to the Checkpoint Flag, where Mario must use a Koopa Troopa to kick into enemies, use a POW Block to take out some Munchers, and use some Bob-ombs to clear some Hard Blocks. He must then follow an angry Wiggler to a Koopa Clown Car, which he can use to evade enemies and make it to the warp pipe at the end. The right path starts with a warp pipe spawning Super Stars, along with coins arranged to read "DASH!!!". Mario must dash his way across three segments of spikes and enemies. Both paths lead to a big winged Bowser, along the ax to clear the level.